Hi, I can’t find the .psd file for the corporate version. I only have the ecommerce version in the psd folder. Yes, they will be available in the next update. Thank you very much, and what about the mobile version? Thanks for being interested in our theme. Yes, this bug will be fixed in the next version. Congratulations for great theme 8theme. I have purchased and am in work editing big time. I have one situation that gives me headache. In Menu I want to use 2 pictures as subitem so the full width of the menu is devided in 2 parts when I click on parent link, exactly like when you click CONTACTS in preview of the theme. The problem is that in my menu, images are shown so small, like 1/5 of the full width of the menu, each. Any hint on this? Thanks for your kind words. We forget to add this in the documentation but you can use CSS classes item-one-half and item-one-third to get menu items wider. We will add this into the documentation soon. If you will have any problems with this contact us through the our support system. Hi there! I’ve invested in 40 over official WooCommerce extensions and am looking for a replacement for my SuperStore theme. However, upon testing your theme via tools.pingdom.com, I noticed that your theme had 124 requests (vs 85 for WooThemes’ SuperStore) and a size of 9.4 MB. Just wondering if you would be able to reduce the amount of requests/queries and also file size? Most themes tested had only a file size of 1 to 3 MB. p/s: Learnt my lesson after purchasing both Bazar and Maya from sara_p. They all look good, but was awfully slow. Found out it was due to the amount of queries done by the theme. Thanks for your report. Its really useful for us. We will do our best in the future to reduce number of requests and optimize our theme for better performance. Thanks! Looking forward for the good news. I need them quickly when the next version comes out? We plan to update our theme in 5-7 days. It is possible ti turn off the “cart” and “add to cart button” to use theme like a catalog and have a contact form in any the product page, so user can ask info or get in touch about the product ? I love your theme! I have one pre purchase question: can I customize the portfolio section in order to make the images bigger and show them going down the page – not as a slider – ? And one more question: can people pay (woocommerce shop) with credit card directly, without paypal? Many thanks and congratulations for the work. Thanks for contacting us. All variants of portfolio pages you can find on our demo. Questions that connected with payment method you can ask in WooCommerce pugin team. I’d like bigger images, scrolling down, smaller text column. This might be a dumb question, but is something I can change in the visual composer? Yes, you can create any layout of project page you want with Visual Composer. 1. is it possible to use a ‘classical’ scroll bar instead your individual solution? 2. could i link to youtube videos and pictures in a lightbox? 3. is there a opportunity to show in a blog with the layout grid only postings from a selected category? 1. Yes, you can disable pluign for smooth scrolling. 2. You can create pictures in lightbox using Visual Composer, but not video. 3. Sorry, but there no such ability at the moment. i know from an other template: the layer slider is hide, if the fancy box plugin is active. We don’t have such bug in Legenda theme, if you will have some problems with it, just contact our support center, we will fix it. firstly, can i use “EURO” with this theme ? secondly, can i use multilanguage (spanish, english, french) ? Thanks for being interested in our theme. Questions regarding all shopping options (including currency changing) you can ask in WooCommerce plugin team If you want to have your web-site in different languages you can use WPML pluign. In next few days you can expect another purchase from me! Great product and even better support! Hi! What’s up with Black Friday? How could I get in touch and arrange for the free installation? Once you have purchased the theme you need to make a request via contact form here: http://themeforest.net/user/8theme, indicate your Item Purchase Code and Purchase Date. The Purchase Date should be: from 2013-11-29 00:00:00 to UTC.2013-12-01 00:00:00 UTC. how to remove the banner in the shop page (/shop ,from demo content)? Have been using Maya for some time. But continue to get feedback about how SLOW my site is. So, purchased this theme 3 days ago and the theme won’t install. Continue to receive wordpress failure notice. Have tried installing through wordpress, ftp and cpanel. Nothing is working. I’ve tried ALL the .zip files I can find. Very Frustrated. I sent my information this morning and did not hear back. Do I now have to wait until Monday to get any help? Just bought the theme and am having trouble installing it. So I would like to take advantage of the Black Friday installation! Sent a support request as requested above, but cannot find the item purchase code, since I bought the theme with funds from my ThemeForest account. Is the popup with the countdown timer included? No, unfortunately. But we plan on to implement such feature with few variants of windows in one of our next updates. Great, do hope that you will implement it on this theme instead of building a new theme again with new features. Otherwise, we as the consumer, will have to buy different theme over and over again, which is not very nice. Thanks. We will try to do our best. hey 8theme..i bought the IDSTORE Theme wp and i dint know anything about wordpressa and so far your support team i gotta give it to them..did almost everything to make my site usable online and elegant design it is indeed. i will surely recommend you guys and keep on surprising us with more beautiful themes kudos Don Haim, helen and the rest of your team 5stars for me,. Thank you very much for your warm thoughts! We really appreciate it. Hi, this is a pre-purchase question. I have been reading the comments on this theme and am concerned on the limited support (before the paid one kicks in). How much support can I avail before I have to pay? Also, regarding the installation. I usually install the theme using the admin panel and then import the demo content using the import plugin. Is this theme installed in the same way or does it take more steps? Also, how extensive is the demo content that is provided with this theme? Another thing i noticed…I am not able to scroll up and down through your demo site using my magic mouse or the built-in trackpad on the Mac.On all other pages in Safari, the scroll works just fine (even on this page it works0. Some bug that needs resolving? 1) Thank you for interest in our theme! Our support is paid service only if you order additional customization! In all other cases you may contact us and ask about theme, theme settings etc and we’ll make all our efforts to help you. 2) Theme archive is big (12Mb), so if PHP memory limit or max post size for Wordpress has been reached, you may face error during installation via admin panel. The easiest workaround for this is to install theme through FTP. Alternatively you’ll need to change a number of settings either on Wordpress or on your web host. 3) Dummy contents includes home, shop, blog, portfolio, contacts, wishlist, register pages, some posts and projects, 48 products and 5 products categories, slider import file. 4) We have tested our theme on Mac and didn’t face any problems with scrolling. Contact us via live chat during our working hours and we’ll test it together. I sent you a really important email and I really hope you get it before you get back to the office on Monday. Do not worry, please, we see your email and have already answered to it. 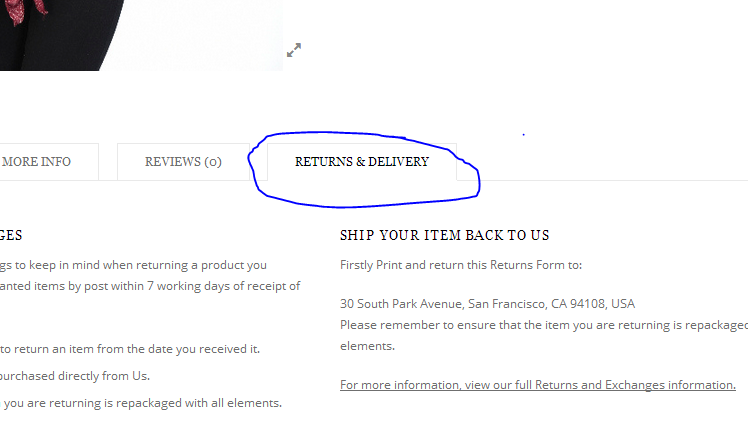 Please, specify what do you want to change, the link “Return to previous page”? This is global tab that you may easily edit in our Theme options in your admin panel.